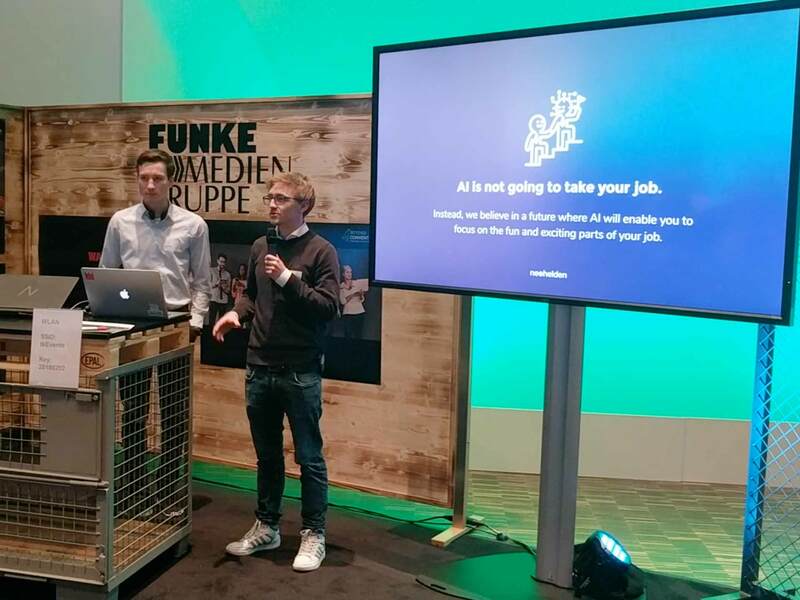 In February 2018, we were invited to pitch and introduce our digital AI-assistant Neo at a "startups meet corporates" event called Beyond Conventions. 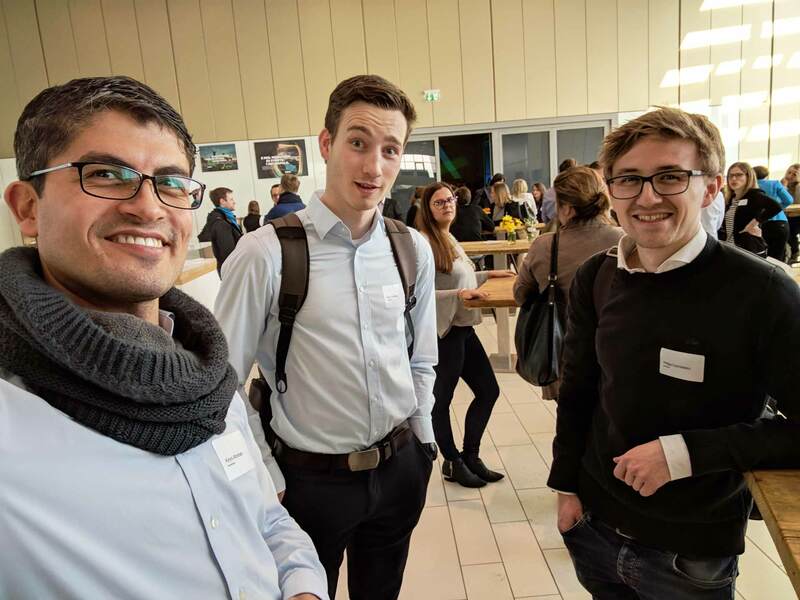 It was hosted by thyssenkrupp in their headquarter in Essen (Germany) and 4 partner-companies: Open Grid Europe, innogy, Schacht One and Funke Medien Gruppe. Beyond Conventions has a very straight-forward agenda: 5 large corporates presented startups 19 challenges they're currently facing and asked applicants to pitch their solution to the corporate's problem. In total, they received more than 220 applications and invited 35 startups to present their solution. So, for both startups and corporates, it's not yet another shot in the dark, but much more a framed setting for developing real business relationships. It was a two-day event packed with keynotes by industry experts and talks by experienced entrepreneurs and CEOs – and, obviously, startup pitches. Our pitch set the stage for discussions with decision makers. We're still in contact with most of them, so the event definitely paid off. But let's cut to the chase: What did we – apart from business cards – take home from Beyond Conventions 2018? As a boy, he and his friends would make their way across the countryside, and when they came to an orchard wall that seemed too high and too doubtful to try and too difficult to permit their voyage to continue, they took off their hats and tossed them over the wall – and then they had no choice but to follow them. This Nation has tossed its cap over the wall of space, and we have no choice but to follow it. Whatever the difficulties, they will be overcome. […] We will climb this wall […] and we shall then explore the wonders on the other side. This metaphor is so powerful due to two reasons: (1) The quote is taken from JFK's last speech (and were the last words of this speech), just the day before he was assassinated in Dallas, Texas. (2) It underlines the fact, that you sometimes have to dare a leap into the unknown. Put in the words of a famous brand: Just do it. We're using this framework as a mental model to understand our partner's setup, their goals and their limitations. This helps us to identify obstacles early on, to cooperate effectively and efficiently, and to better understand their needs. Isn't your calendar, too, packed with meetings and calls? Always on the run, always "busy"? 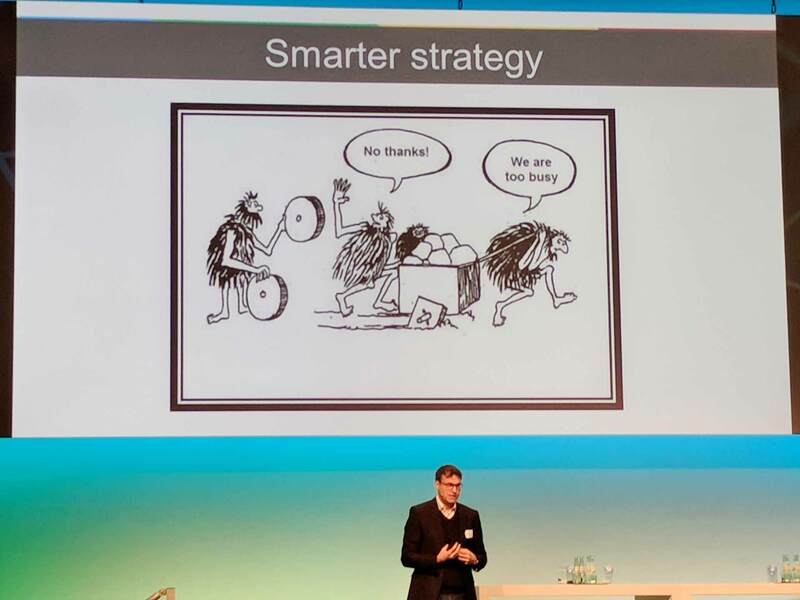 This cartoon taken from Stefan Hentschel's keynote illustrates that point really well. What one might plainly prejudge corporates for, is actually applying to us as a startup: We've recently had a lot of meetings, pitches and calls, so that we run the risk of not looking into new tools, approaches and technologies. That's we implemented a measure against that from day 0 on: Every employee at Neohelden is granted an annual budget for personal and professional development, that can be used for buying books, courses, ticket for conferences and so on. It's pivotal to break out of our "comfort zones" and get to see what's out there. Dynaxity is a made-up term used to describe our lives and environment: New information is created at ever accelerating speed, data gets accessible, we're "always on" and connected to a global data highway. The tension between complexity and the sheer unbelievable dynamics can quickly become too much to handle for ourselves. Yet, we have to deal with complex systems and data everyday at work – world moves on, after all. To solve the problem of information overload, we created the digital AI-assistant Neo. Konstantin Mehl, founder and CEO of foodora and Kaia Health, gave a presentation and talked about his lessons learned from creating, growing and scaling successful startups. His advice for early stage founders: If you scale early (i.e. growing from 1 customer to 3, or better yet from 3 to 3,000), you might impress some investores, but you'll inevitably scale your problems, too. Instead of quickly scaling a prototype, you should focus on getting the fundamentals right with a handful of strategic customers. Once you're confident that your solution actually works (and doesn't blow up), you can start focussing on growing and scaling your customer base. In Germany, there's tons of financing- and funding-opportunities out there (although German founders like to complain about it a lot). What's missing is, however, real business development opportunities that work for both startups and corporates – especially considering that we're in Germany, a country with lots of well-established businesses. Beyond Conventions could function as a blueprint of enterprise-startup collaborations, as it is straight to the point: Problems are to be solved within the scope of a pilot-project, corporates get to meet pre-selected startups that could potentially meet their needs in an efficient manner (that's something that Germans like a lot), and startups get exposure to not only one pilot customer, but three to five. After all, finding a strategic partner is much more valuable on every dimension than winning an award with some prize-money and a trophy!